In the early 1840s Danish King Christian VIII decided to embark upon an ambitious expedition of discovery and scientific research. 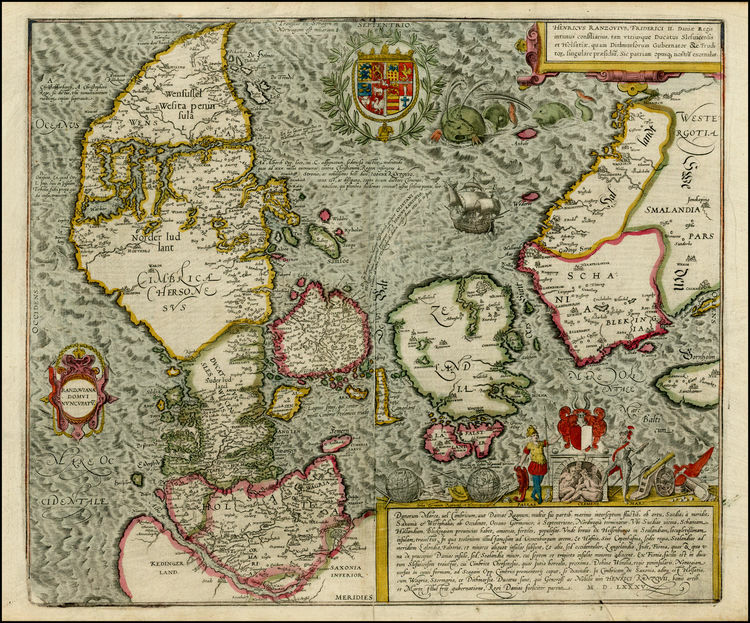 King Christian ordered the Danish Navy to outfit a ship for an around the world adventure which would be part vanity project, part scientific voyage and part geopolitical gambit. On June 24, 1845, the 43 meter corvette Galathea departed Copenhagen on what would become a nearly two year voyage. Stuffed aboard the Galathea were 36 cannon, provisions for a year and 231 sailors, scientists and officers. Incredibly, the voyage cost the Danish treasury ~3% of its annual expenditures – by comparison NASA’s Apollo project was ~4% of the US federal budget. Sailing south, the Galathea rounded the Horn of Africa and visited the Danish colonies at Tranquebar on the west coast of India. The expedition then called at the Nicobar Islands in the Indian Ocean southwest of Sri Lanka. After a stopover in China to improve Sino-Danish trading ties, the Galathea headed for the Sandwich Islands (modern day Hawaii). Departing the Sandwich Islands, the Galathea and her crew made a couple stops in South America before sailing around Cape Horn for home. During the course of the expedition, the Galathea’s science team gathered 93 boxes of organic and inorganic specimens as well as 21 boxes of local material culture and a large collection of objects from Java. Among the collection were 368 dragonflies from 107 different species with 37 of these unknown to scientists of the day. Sadly, the expedition’s royal sponsor perished shortly after the voyage returned in 1847 and Prussia and Denmark descended into conflict. These two events stifled the processing and publication of the expedition’s results and many of the boxes of specimens remained unopened for several years. Following the Nazi invasion in April 1940, Denmark entered an uneasy period of occupation by their Nazi overlords. Because of their ethnic heritage as a Nordic/Scandinavian people, the Danes were generally treated better than other occupied peoples, however, King Christian X famously rode his horse through Copenhagen on a daily basis as a symbol of silent resistance. Among the institutions left to function with only a modicum of Nazi intervention was the Danish Navy which performed minor minesweeping duties off the nation’s islands to prevent the sinking of coastal ferries. As the war progressed and it became clearer that the Nazis would soon confiscate their warships, the naval high command devised a plan to deprive the Nazis of the entire Danish Navy. The Danish Navy had once been among the most powerful in the world and it wasn’t until Admiral Nelson’s successful attacks on Copenhagen that it was reduced to a minor fleet. By August 1943 it consisted of two coastal defense ships, ten torpedo boats, seven minelayers, a dozen submarines, five ocean patrol vessels, seventeen minesweepers and a handful of auxiliary vessels. The Nazis decided to take over the Danish Army and Navy on August 29, 1943, however, the officers of the Danish Navy were determined not to let even their meager force fall into enemy hands. As the Nazi forces approached the Royal Dockyard in Copenhagen early on the morning of the 29th, a pre-arranged signal was hoisted which instructed each of the vessel’s commanders to scuttle their ships. Within 30 minutes, 32 of the Danish Navy’s vessels lay at the bottom of Copenhagen harbor and another four were on their way to internment in neutral Sweden. 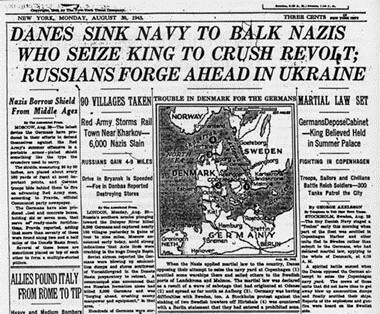 Out of 52 vessels, the Nazis were only able to seize 14 untouched. Nine Danish sailors perished in the scuttling, another ten were wounded and a significant portion of the Danish Navy’s personnel were interned by the Nazis. While it may not have deprived the Kriegsmarine of any significant warships, the defiance exhibited by the Danish Navy strengthened the morale of the Danish Resistance and told the world that the Danes would not go quietly into the night. Frozen in Time by Mitchell Zuckoff is a thrilling tale of survival, heroism and discovery. Set in Greenland, Zuckoff switches between World War Two and the present day to relate the loss of three American military aircraft and the epic search for both the planes and their survivors. Zuckoff writing flows smoothly between the historic loss of the planes and the modern day search and the book’s 330+ pages seem much shorter as a result. Perhaps one reason for Zuckoff’s engaging style is that he accompanied the 2011 expedition in search of the Coast Guard float plane that had gone down while searching for the other two missing planes. While set in World War Two, the book is not military history, but rather reads more like heroic survivor stories such as David Howarth’s We Die Alone or polar exploration tales like The Last Viking. Frozen in Time showcases Zuckoff’s excellent attention to detail as the minutae of daily survival in a downed plane in arctic conditions is relayed to the reader; however, Zuckoff avoids the trap of losing the story (and the reader) in the minor details. The book also benefits from the generous use of photographs to document both the characters and the events described in the book. One amusing anecdote from the book is the author’s description of the whiskey his team chose to bring with them to Greenland – a modern recreation of Ernest Shackleton’s whiskey. Overall, Frozen in Time is a highly readable book that will appeal to anyone wishing to relieve the dog days of summer with a chilling tale of survival in a frozen land. In early 1801, the Royal Navy dispatched a fleet to the Kattegat to break up the League of Armed Neutrality – an alliance of nations helping to supply the French Revolutionary government which was at war with Britain. After much debate between the fleet’s two senior commanders, Admiral Sir Hyde Parker and Lord Nelson, the decision was made to destroy the Danish fleet by launching a daring assault on its Copenhagen anchorage. Destruction of the Danish fleet would secure British access to Scandinavian timber and render much of the Baltic Sea a British lake. After personally reconoittering Copenhagen’s harbor, Admiral Nelson sailed his force into the teeth of the Danish fleet’s well-prepared positions. Disaster struck quickly as three British ships of the line (Agamemnon, Bellona and Russell) ran aground on the Middle Ground sand bank. Lord Nelson ignored this setback, though, and his ships began pounding the Danish line with devastatingly accurate fire. Despite being ordered to retreat by Admiral Sir Hyde Parker, Lord Nelson continued the battle and ship by ship the Danish guns fell silent. Approximately four hours after the battle began, a ceasefire was agreed upon and twelve Danish ships were turned over to the Royal Navy in addition to three more lost to British gunfire. Only one of the prizes was kept afloat and the British victory signalled the beginning of the end for the League of Armed Neutrality. Lord Nelson not only earned his Viscount title as a result of the battle, he also enhanced the Nelsonian myth by refusing to withdraw despite Admiral Sir Hyde Parker’s orders. Legend has it that Lord Nelson raised his telescope to his blind eye to read Parker’s signal and remarked “I really do not see the signal” and therefore would continue the battle. Regardless of the truth of the tale, Lord Nelson’s actions once again proved legendary. Some of the most impressive maritime images are derived from ships being found in places where they are completely out of their element. Blogger gCaptain compiled a grouping of photos the top ten maritime incidents of 2012 and many of them are ship’s aground in spectacular locations or angles. More than a century ago, the Danish steamer SS Knud created a similar image when it ran aground in Robin Hood’s Bay on January 2, 1900. The steamer had been launched on October 19, 1871 and was a Clyde built merchant steamship of 1,185 tons. When she ran aground she was loaded with a cargo of ballast, but thankfully none of her crew were lost in the debacle. 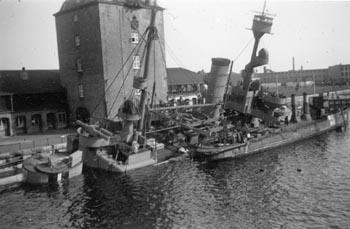 The cargo was later salvaged and the ship sold for scrap. 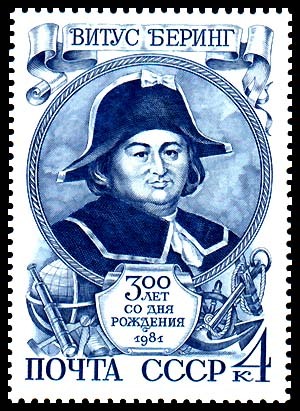 Today marks the 288th anniversary of Russian Tsar Peter I ordering Danish explorer Vitus Bering to explore the eastern reaches of the Russian Empire in the area of Kamchatka (“That place you can attack Alaska from” in Risk). This expedition, along with a second, gave the world a better understanding of the far eastern regions of Russia and western reaches of North America. Vitus Jonassen Bering was born on August 5, 1681 in Denmark and first went to sea at age 18 which was relatively late for the time period. Bering joined the Russian Navy in 1704 and after twenty years of lackluster service, Bering was tapped by Peter the Great to lead the Kamchatka expedition described above. Due to his service in the Russian Navy, Bering also came to be known as Ivan Ivanovich Bering (not to be confused with Ivan Denisovich or Ivan Drago). Bering and a team of 34 men embarked on their voyage of discovery in February of 1725 and spent the next five years searching for a land connection between Russia and North America. During their voyage, the expedition also prepared charts of the region and Bering was promoted to the noble rank of Captain Commander for his exploits. Thirteen years later Bering set forth on yet another expedition to the area. During this second voyage, Bering was able to sail within sight of Alaska and discover part of the Aleutian Island chain. Sadly, Bering perished before the expedition could return to St. Petersburg and his remains were interred on what is now Bering Island. Even though Bering accomplished very few “firsts,” he was widely associated with the region which he explored and thus it is unsurprising that Captain James Cook named the strait between Alaska and Russia the Bering Strait.